No foolin! It’s April! It’s also the first Friday in April which means it’s time for another ScrapMuch? Team A double page layout reveal. I managed to mix in some new with the old by using my Heidi Swapp Minc again with a few Minc shapes for the embellies. The washi tape is Graphic 45. The heart border is a Martha Stewart punch. I got to use my Dear Lizzy roller stamp to stamp the memorable date as part of the embellishment cluster. And the title is American Crafts. So now it’s your turn to hop on over to the ScrapMuch? blog and see what the rest of Team A has created for your inspiration! As always, I hope you decide to join in on one of the sketch or colour challenges and share with us for a chance to win an awesome ScrapMuch? prize! Here is a run down of the Sketch-y Friday rules. Just link up your creations in the ScrapMuch? sidebar to be entered into a random draw for our monthly prize. You have until April 29th, at midnight to participate in any of this month’s sketch challenges, each linkup tool will remain open until that date! You may take some artistic license with your adaptation of the sketches, however if you choose to use a double page sketch for a single page layout you may only enter once per sketch, not once per side. If you are playing along with more than one challenge you will need to link each of them up via a separate blog post for the link up tool to work. (International participants may be required to pay some shipping fees.) Good luck, we cannot wait to see what you create! Hello everyone! It’s time once again for another ScrapMuch? Sketch-y Friday Team A reveal! Indulge me while I share another selfie from my trip in my layout for this week. It was just one of those moments, I was so blissed out, so loving my scenery, so happy to have had a great day surprising Mom. It was pretty much a perfect day. I drew on some YouTubes for some inspiration for this layout. I was watching some Jen Schow process vids, specifically on 6×6 love. I have so many 6×6 paper pads and I definitely don’t use them enough. I used to use them for cards a lot, but I’ve barely had time to scrap these days much less make cards. Most of the papers were from a Teresa Collins 6×6 paper pad. To deal with the seams on the side I just used a doodled line to unite them. The gems on the page are also Teresa Collins. The wood, flair and puffy sticker are from Evalicious. And last but not least, the delight title is a Heidi Swapp word that I of course, sent through the Minc with rose gold foil. The machine I never thought I’d use gets used on almost every layout. Go figure. I flipped the sketch on it’s side to show how versatile sketches are. Please don’t feel limited to use them as illustrated, they are but an inspiration jumping off point. Hop on over to the ScrapMuch? blog to see what the rest of the team has created for your inspiration this week. Here is a run down of the Sketch-y Friday rules. Just link up your creations in the ScrapMuch? sidebar to be entered into a random draw for our monthly prize. You have until March 29th, at midnight to participate in any of this month’s sketch challenges, each linkup tool will remain open until that date! You may take some artistic license with your adaptation of the sketches, however if you choose to use a double page sketch for a single page layout you may only enter once per sketch, not once per side. Hello everyone and Happy MARCH!! Spring is right around the corner! I had an absolutely amazing time away. It was so much fun to surprise my mom by arriving a few days earlier than planned. We really had an amazing time just the 4 of us and I can’t wait to do it again. I didn’t take as many pictures as planned, even though Santa brought me a great new point and shoot camera that even takes underwater shots. I think I was so busy being in the moment that I really wasn’t thinking about capturing the moment. I used mostly my Jillibean Soup Sightseeing Stew pack for this layout. It truly amazes me how many layouts I get from a paper pack, no matter which one I buy. I grabbed some ruffled ribbon from my stash, some October Afternoon washi tape, some American Crafts thickers, some Evalicious wood accents, a flair button from Lawn Fawn, an accordion flower from Pink Paislee, a Heidi Swapp Minc chipboard element, a couple of cards from We R Memory Keepers for the journaling and heart accent, some jewels from Ki Memories and lastly some colour shine mist by Heidi Swapp. So now it’s your turn! Hop on over to the ScrapMuch? blog and see what the rest of Team A has created for your inspiration. You have until the end of the month to link up with us for a chance to win an awesome ScrapMuch? prize! As always, I can’t wait to see what you create! 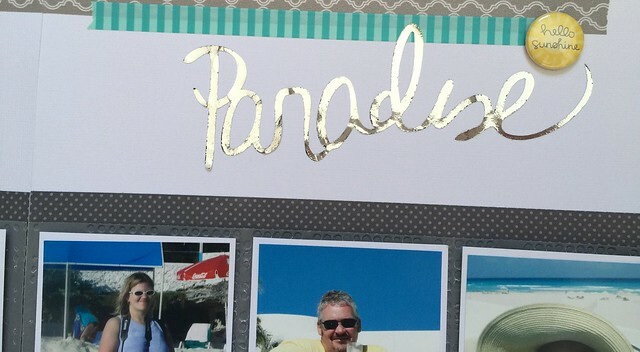 Paradise – ScrapMuch? Sketch-y Friday Reveal! It’s the first Friday of the month, which means it’s time for another ScrapMuch? Sketch-y Friday Team A 2 page layout reveal! I am so excited to see February get here! It’s vacation month for me and I’m finally heading south to visit my happy place after 3 long years. So of course, past memories of my time there became the inspiration for this week’s layout. 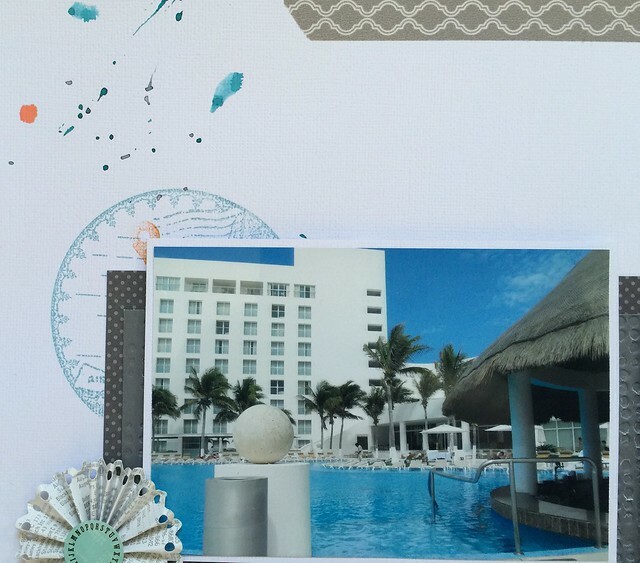 I used my Kelly Purkey stamps in blues, as well as some Teresa Collins stamps, because of the amazing waters, and orange because it’s one of the resort theme colours. Everything in the resort is white, silver and orange. That little Enjoy The View tag is from a treasure box from a vendor at a mega crop I was at in November. I love love love this title! It’s a Silhouette cut file that I filled in with black, printed on my laser printer, cut with the Silhouette and then sent through the Minc with silver foil. I also used an embossing folder on the second piece of patterned paper but on the reverse side to create a debossing effect. The flair up top is from Lawn Fawn. The washi is Bella Blvd and My Mind’s Eye. More shots of the debossing, the Tattered Angels stamp and some messy misting. 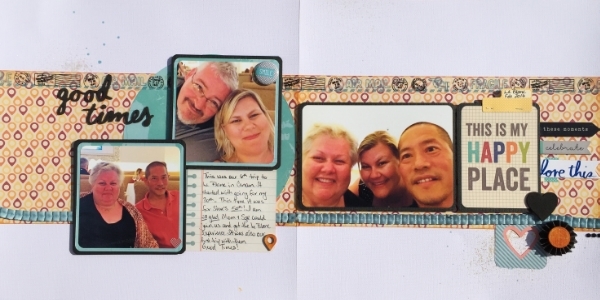 I even dug into my stash and used some of my favourite 7Gypsies paper for this layout. Both grey pieces are from the same 7Gypsies line, as is the ribbon. The accordion circle embellishment is from Pink Paislee. So now it’s your turn! Hop on over to the ScrapMuch? blog and see what the rest of Team A created for your inspiration this week. Make sure to link up your sketch inspired creations by the end of the month for a chance to win an awesome ScrapMuch? prize! As always, thanks for visiting and I can’t wait to see what you create! See you in 2 weeks! It’s also time for a ScrapMuch? Sketch-y Friday Team A Reveal! This week I am featuring a special little lady who turned 1 on December 1st. I figured it was a fitting layout for this week, as this Sunday marks 1 year since her adoption into our home and hearts. I’m talking about none other than sweet Tiffany. She also has a Game of Thrones name of Tiffalyn Baratheon. I’m not sure how I feel about her being a Baratheon… I digress.. Just like the photoshoot I did with Bella on her 1st birthday, I felt it was important to capture Tiffany’s 1st birthday too! All patterned paper is Maggie Holmes for American Crafts. I fussy cut the flowers to create the circular elements. The polkadot heart, title, and 2 squares are all Heidi Swapp Minc products that I used rose gold foil on. The pearls and chipboard ampersand are Pebbles. The floss is American Crafts. Cardstock is Bazzill Basics. 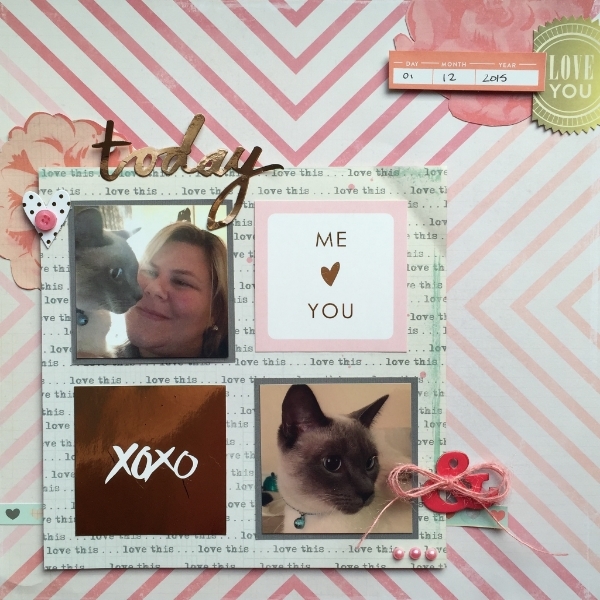 Speaking of Heidi Swapp Minc…. I am in loooooooove with her new CHA releases for the Minc! I can’t wait to get my hands on the reactive mist and ombre foils!!! Had to believe the machine I never thought I’d use I have used on almost every layout since. I just love that metallic pop. As you can see I took a little liberty with the sketch this week, mostly because I was really inspired by those 3×3 Minc elements. So now it’s your turn! Hop on over to the ScrapMuch? blog and see what the rest of team A has created for your inspiration! I hope you get a chance to create your own sketch inspired pages to share with us! Here is a run down of our Sketch-y Friday rules. Just link up your creations in our sidebar to be entered into a random draw for our monthly prize. You have until January 29th, at midnight to participate in any of this month’s sketch challenges, each linkup tool will remain open until that date! You may take some artistic license with your adaptation of the sketches, however if you choose to use a double page sketch for a single page layout you may only enter once per sketch, not once per side. 2016 is here upon us, and I hope it greets you all well. Believe it or not, but it’s time for some ScrapMuch? Sketch-y Friday Team A inspiration. I actually have some scrapping plans this weekend. I figured I’d use these last few days of holiday staycation to work on some of my projects from the Teresa Collins Vegas event that I didn’t get to complete on site. Speaking of holidays, since it’s so close to Christmas, I allowed myself one last Christmas themed layout to share for this holiday season. Christmas photos for me are so rare lately that I had to dig deep and pull out some pictures from a few years ago. Ok, ok, so it is close to 8 years ago, but who’s counting?! Santa even gifted me an awesome point and shoot, and I tried to do a photo a day for December. I think I managed to make it to the 5th…. All the paper is from Simple Stories and the Cardstock is Bazzill. 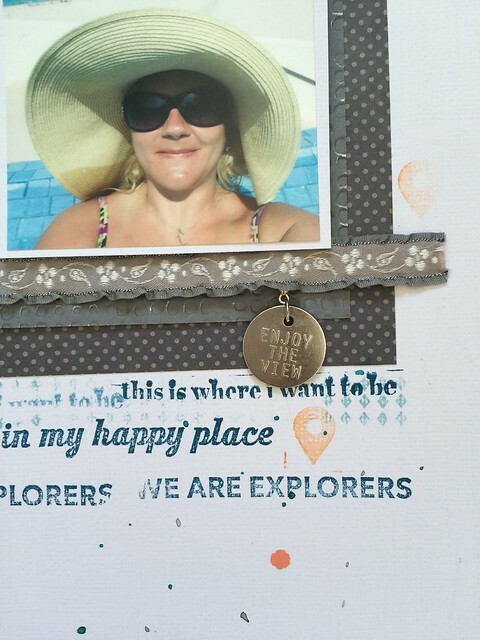 The ribbon is from my stash, and the die cut borders and title were from my Silhouette. I also glammed up the title with some Wink of Stella clear marker over top – and a little brown Wink of Stella on the tree trunk too. The bling atop the tree and the 25 wooden element are Tim Holtz. You may notice some shadows on my layout. I took it outside in the warm December sun (!!!!!!) – seriously! So now it’s your turn! Hop on over to the ScrapMuch? blog and see what the rest of the team has created for your inspiration. Create your own sketch inspired layout, and share it with us for a chance to win an awesome ScrapMuch? prize! See you in 2 weeks with my next reveal! 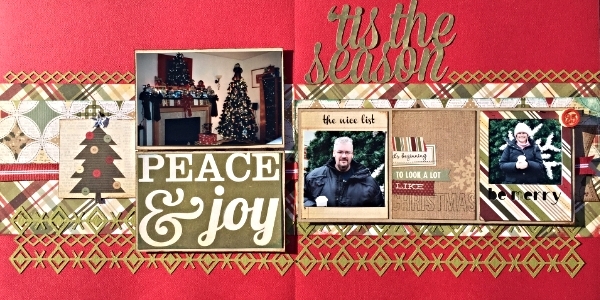 Ok. You’re seriously not going to believe this – but this is my last reveal for this year for ScrapMuch? Sketch-y Friday. I’ll be back in the new year, but this is the last one scheduled for Team A. 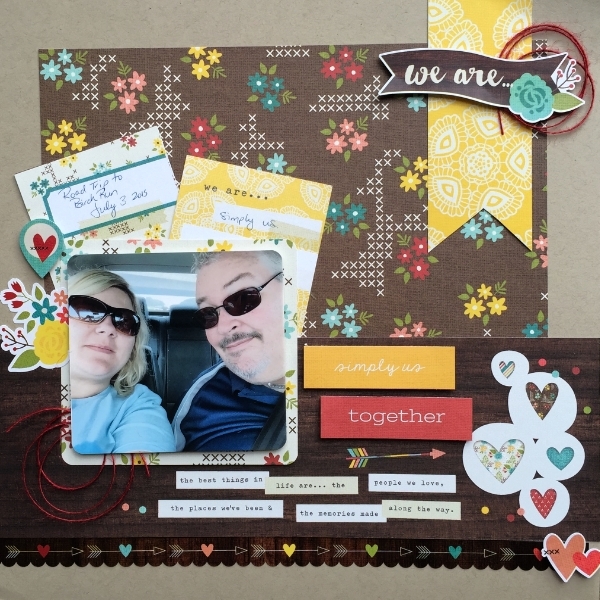 For this week’s layout I used more of the Simple Stories We Are…Family collection. This is actually a collection I totally loved in the store, then got it home and had no idea what on earth to do with it. I’ve actually *forced* myself to use it for 2 reveal layouts and I love the finished product for both of them. I’ve also made a concerted effort to use all the stickers and goodies in the collection packs instead of “saving them for the perfect layout”. All products Simple Stories except cardstock from stash, and twine from American Crafts. So now it’s your turn. I hope you get some crafty time before the end of the month so you can link up your creations for a chance to win an awesome ScrapMuch? prize. Hop on over to the ScrapMuch? blog for some more Team A inspiration. Wishing you and yours a very Merry Christmas and the happiest of New Year’s!